A dark, snaking line across the lower half of the sun in this Feb. 10, 2015 image from NASA's Solar Dynamics Observatory (SDO) shows a filament of solar material hovering above the sun's surface. SDO shows colder material as dark and hotter material as light, so the line is, in fact, an enormous swatch of colder material hovering in the sun's atmosphere, the corona. 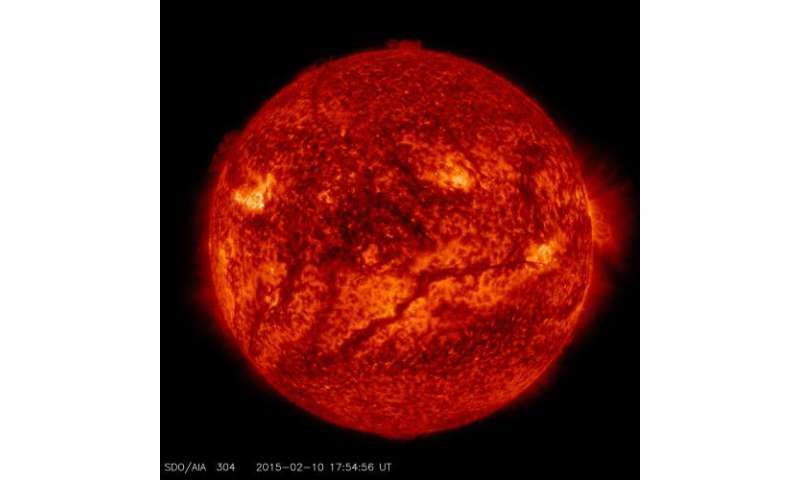 Stretched out, that line – or solar filament as scientists call it – would be more than 533,000 miles long. That is longer than 67 Earths lined up in a row. Filaments can float sedately for days before disappearing. Sometimes they also erupt out into space, releasing solar material in a shower that either rains back down or escapes out into space, becoming a moving cloud known as a coronal mass ejection, or CME. SDO captured images of the filament in numerous wavelengths, each of which helps highlight material of different temperatures on the sun. By looking at such features in different wavelengths and temperatures, scientists learn more about what causes these structures, as well as what catalyzes their occasional eruptions. Launched on Feb. 11, 2010 aboard a ULA Atlas V rocket from Cape Canaveral Air Force Station, Fla., NASA's Solar Dynamics Observatory is designed to study the causes of solar variability and its impacts on Earth. The spacecraft's long-term measurements give solar scientists in-depth information to help characterize the interior of the sun, the sun's magnetic field, the hot plasma of the solar corona, and the density of radiation that creates the ionosphere of the planets. The information is used to create better forecasts of space weather needed to protect aircraft, satellites and astronauts living and working in space. It seems unlikely that a giant, self-sustaining nuclear bomb could burn for 4.6 to 6 billion years and then suddenly grow in power to a Red Giant phase and engulf hundreds of times the volume in what amounts to a cosmic blink of an eye. The Sun shows very little signs of major instability, as only the very, very strongest solar eruptions in history have had any impact on man whatsoever, what knocking out electricity in Canada a time or two and making a light show for early astronomers, but causing no damage otherwise. It would take something ten or 100 times stronger than the strongest eruptions in history to have any real effect on humankind. My theory is that Helium already burns inside the Sun in a sinusoidal cycle. When the Helium hits critical mass/density it burns on one extreme of the cycle, and when it drops back below critical mass/density it is on the other extreme. this is a likely cause of some of the cycles of the Sun. I believe that Red Giant stars are younger than anticipated, and they form when a Star starts with a higher helium ratio in the first place, or a slightly higher mass. the Sun falls into a window, in my view, which does not produce a Red Giant phase. It is already at a threshold where it blows it's own surface away through solar winds and CME, so in my view it cannot get any hotter because the only thing that would accomplish is blowing itself away faster. Red Giants don't technically blow themselves away right away. They go through a period of heavy swelling and get eaten up by planets or other stars. I don't see the Sun showing any evidence of turning into a Red Giant star. What I do see is the Sun gradually cycling through burning two or more types of fuel in different ratios, simultaneously and in sinusoidal fashion. It can't become a Red Giant because it's already exhausting the core smultaneously with the Hydrogen. A star that is 10% more massive would burn ~40% faster, which means it would accumulate other elements in the core much more quickly, and this in turn might allow the Red Giant phase to occur. I just don't think that something that has stuck around in much the same condition for 4.6 billion to then 5 or 6 billion years is suddenly going to become an order of magnitude more luminous just because the ratio of hydrogen to helium changes. Yes, helium fuses at a higher temperature (or greater density/pressure), but most of the isotopes also give off less energy per unit mass of the atom than does most of hydrogen isotopes. It also means that those lower grade fuels are already being burned up ahead of time, so that the denser core/expanded exterior scenario of a Red Giant seems unlikely to happen. think about it logically. If there is some level of energy that would cause the Sun to expand and engulf Earth and possibly even Mars, like the Red Giant theory claims, then there has to be an infinite number of levels of energy between present level and that level. In order to get to the higher level it has to traverse those levels between. This means you need to not only be burning Helium faster, but you have to be accumulating helium faster too in order to maintain the growth in the fuel that would be needed to have higher burning in the future. This makes no sense, because once helium starts burning, that means a min-collapse of the core has happened and it puts out enough power to stop that and the helium is exhausted and stops burning. It's like if you threw a cup of gasoline on a fire (don't try it). the fire blows up for a split second and then it runs out of open fumes and burns off the fumes evaporating from the liquid for a few more seconds, and then the fire goes back to normal like nothing happened. Throw another cup on there...FLASH!! What does that look like? A Solar Cycle of course. It doesn't look like some fictitious self-sustaining phase that's 10 or 100 times as powerful. the Helium can't suddenly jump to some super-energetic state. If it could have it already would have happened, as the Sun was actually more massive, therefore more energetic, in the past. Any reaction eventually reaches a peak when the maximum amount of fuel that can be ignited is ignited (peak of a solar cycle). It may be that long-term cycles are caused by the CNO and short-term cycles are caused by Helium. Who knows. Better computer models are needed, that's for sure. So you write a book to ask who knows? Skippy, just about everything you wrote up there is wrong. Better computer models are needed, that's for sure. Okayeei Cher. Maybe you should spend your time making one of those instead of wasting it writing down a bunch of foolishment on the physorg. This returners guy is quite entertaining. After reading those posts it has all become clear. You show the great scientific prowess of the typical CAGW believer. All joking aside, you should get to work on that helium burning experiment to prove your highonpothosis. You should probably avoid inhaling any more of those gasoline fumes.